At least the burrito slippers are warm. This strip started out as a way to introduce a prop for Amelia. Namely a hat of some sort. See, now it’s Amelia’s turn to give me grief. I have been struggling with her character design for some time now. I’ve been trying to get back to the original feel when I first did character sketches a year ago. She was more kid-like and more tom-boyish. So in my challenge, I thought maybe a hat would help things. I decided against the hat I think (but pressed on with the gag). My theory in drawing a character is they should be fun to draw. If they are fun, it shows. If they aren’t fun, your hating life. So more minor tweaking I guess. I have a guest strip coming up in June for another artist’s comic. Amelia is making an appearance (spoiler alert) and I need to dial her in soon. I like hat #2. Is that Carl’s grandfather by any chance??? Thanks for the super fashion show! I wonder what she’ll say about the jelly shorts! It’s the thoughts that count. Yes, I supposed it is. Quite a thought too. It’s made of synthetic material! Yeah. She’s fine. I’m just being over critical. It’s what I do best. Yeah. I second that! Funny thing is that it was a last second addition. Those are usually the best, in my experience. Yep. Some of my best bits have been an as-I’m-inking-the-dialog move. 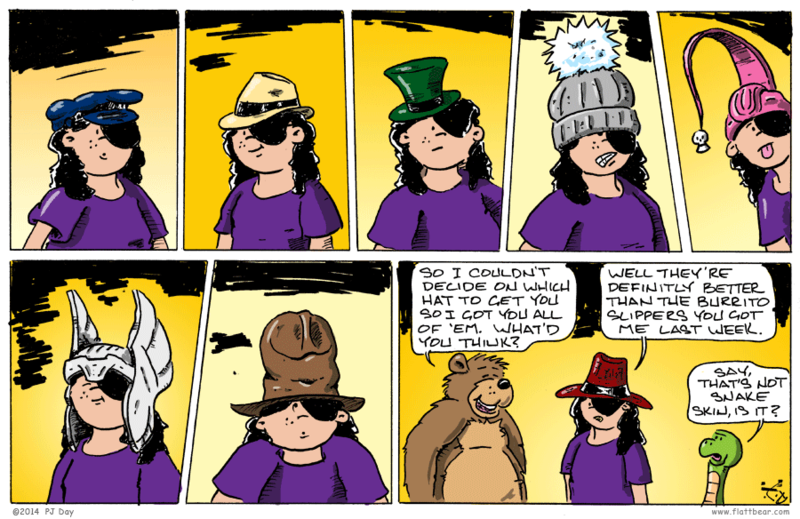 Great comic P.J., my hats off to you! Hey. I see what you did there.